Found one file extension association related to Text Formatter Plus and 1 file format developed specifically for use with Text Formatter Plus. Text Formatter Plus makes it easy to produce well-formatted ezines and emails. 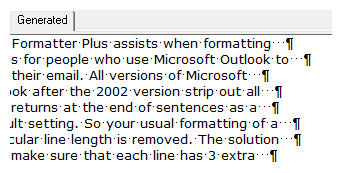 ext Formatter Plus you set a line length for your document and then the program formats your text at that width with hard returns added at the end of each line. It's easy to make changes to your document and then reformat, saving you significant time. If you need more information please contact the developers of Text Formatter Plus (FormatBlue Software), or check out their product website.